The psychobilly pompadour is a distinct hairstyle, rising from the swamps of the punk rock Mohawk/Mohican to mate with the undead bride of the 1950’s greaser curl to produce an iconic look with variation. Usually the forward spike that defies gravity and, depending on how dedicated the psycho cat it, it could be anywhere from a few inches to a full foot in height. Keeping such a look must be hell, especially with all the products out there. I’ve never rocked anything near what the most extravagant psychos or punks have presented, but I have gone through a cavalcade of creams, sprays, waxes and gels. Some of them were rancid oil products that could double as napalm. Others were goopy and amorphous, like they could really ruin Steve McQueen’s night. You don’t want to be putting crap in your hair. No glue. Nothing that seems like it could double as axle grease. You want to stick to all natural and high quality. Ergo, the multi-purpose Putrescence from Grave Robbers Union Local 666. This week’s Tuesday uEtsy put GRUL666 in the spotlight and they were very kind to provide a 1.oz tin of their new product. It’s a mix of “Microcrystalline wax, Beeswax, Olive Oil, Coconut Oil, and Cinnamon/Clove Essential oils.” If you can both count the ingredients on both hands AND easily pronounce them, you know the product’s a winner. And Putrescence is a winner. The oils involved in the product are good for dried skin. I tried it on my hands and it seemed to relieve the sting of the winter’s cold. It works as well as a lip balm. If you’re getting ready for a noontime meal or a midnight kiss, you want to have some life in your lips and Putrescence brings them back from the dead. But the primary selling point is as a hair product and I can tell you that it’s great. You only need a little bit to get your hair to stand straight up – this is maximum hold. It’ll have your hair standing on end like you’ve seen a ghost and after a nice wash, back to normal. It’s mostly natural, even if the people who make it aren’t. Your hair smells like a sandlewood coffin and your hair has the hold of a vampire’s spell. Currently, the 1.oz variety, good for those who want to carry it around with them in their pockets or bags, runs for $4.25 + $4 shipping. And we’re proud to share the announcement that GRUL666 has just added a compact for inclusion with all orders of 3 oz tins. You’ll get a compact mirror with your Putrescence tin for cheaper price than just for a competing hair product. A very good deal and you’re supporting a small business. If you want all natural, if you want a bargain and if you want a great product that makes you feel, look and smell good, then you definitely want Putrescence. 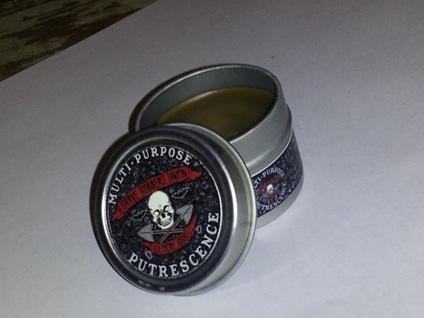 EDIT: an earlier version of this post claimed that Putrescence was 100% natural, but Grue of GRUL666 informed me that due to the Microcrystalline wax, a petroleum product, they can’t make the claim. However, he did say that they’re switching over to soy wax from bees wax so the product will be vegan-safe. I still stand by the product’s effectiveness to sooth cracked skin and mold your hair.